After two days in Hong Kong, our tour group was heading for a one-day tour of Macau on 22 January 2018. Just an hour away from Hong Kong, but quite different from it, is Macau an autonomous territory of China. You'll need your passport to travel between these two regions. However, foreign tourists to Hong Kong generally have no problem entering Macau with a free short term stamp on their passport. The same country but separate, that’s the best way to describe the relationship of Hong Kong and Macau with China. But while these former colonies and now special administrative regions of China are self-governing, and have their own laws and distinct identities, they are all three drawing closer. This is also true of currency. China, Hong Kong, and Macau also all have their own currencies but where we can use which currency can be a little baffling. The Macau Pataca or MOP, is the currency of Macau. It is on par with the Hong Kong Dollar (equal to 8 plus INR) which is a semi-official second currency in Macau and the most popular as it can be used just about everywhere. The Chinese Yuan is usually accepted in hotels, casinos, and upmarket restaurants but is not in common use and won’t be ​taken in most shops or on public transport. Considering these facts, all of us stuck to the HKD. Our Tour Manager instructed the men folk to dress in formal clothes - avoid shorts and casual slip on footwear, as Casinos have dress codes. We had also been advised to carry a couple of Indian snacks too - just in case - though of course we would be taken to an Indian restaurant for lunch. 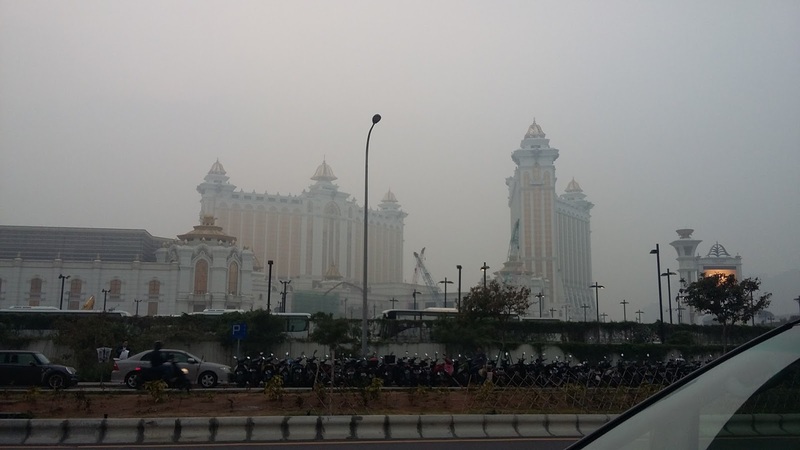 The mega-resort and casino center of the East, Macau is the new gambling resort capital of the world, with 5 of the world's 10 largest casino resorts. At the same time, there are also old Portuguese sites to see, including UNESCO World Heritage sites. We can travel from Hong Kong to Macau by air, ferry or road. Though taking a bus is possible, the ferry is the most preferred, as this is much faster than going by bus through Shenzhen. Cotai Water Jet plying between Hong Kong and Macau at regular frequency, covering the distance in an hour, is the most popular, as it saves time and money. With a seating capacity of 245 seats, it has a speed of 35 - 50 knots. We had to take the 11 o'clock Cotai Jetfoil from Hong Kong Macau Ferry Terminal. We reached the Ferry Terminal at 9 am. It was a sprawling place - like an airport terminal but much less crowded. We went through Immigration which was pretty quick. Then we spent our time hopping in and out of the attractively decorated shops dotting the terminal. Boarding was announced 15 minutes prior to the cruise and we occupied our comfortable seats. The one hour cruise was relaxing and enjoyable. 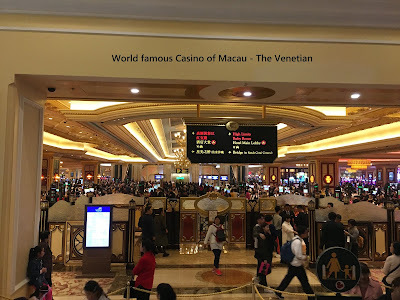 We alighted at Cotai Terminal, closest to the Cotai Strip area with the biggest casinos such as the Venetian, the City of Dreams across the street, as well as the Macau International Airport. Our local guide greeted us and took us to our coach. He spoke good English. We picked up one useful Chinese expression - "Nee how?" meaning "How are you?" I used it very naturally with a couple of acquaintances - because it was very easy for me to remember. "Nee' in Tamil means "you" and "how" is typically English! We enjoyed the drive through the city. We saw Kun Iam Statue, made of special bronze and 20 meters tall, dedicated to Goddess of Mercy. 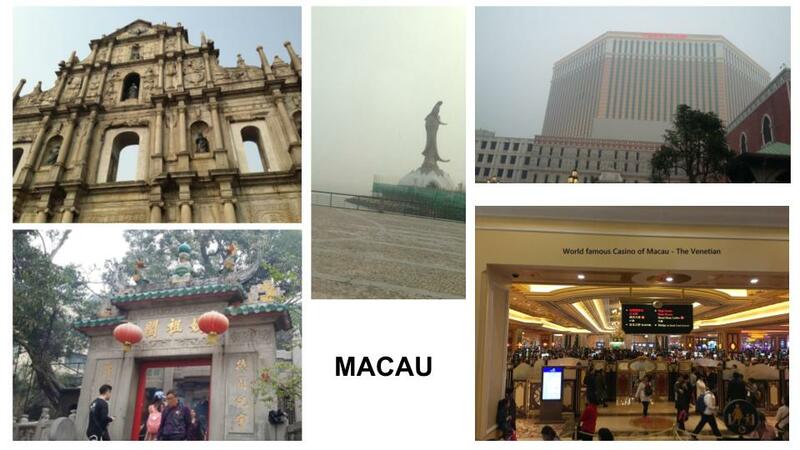 The statue faces Macau in order to protect it symbolically. It is built on a dome shaped like a lotus flower, which houses an ecumenical center providing information on Buddhism. also known as "Mater Dei". The ruins were restored by the Macanese government into a museum. Today, the ruins are one of Macau's best known landmarks. In 2005, along with A Ma Temple, the ruins were officially listed a UNESCO World Heritage Site. There is also a Museum adjacent to this. As we were walking back to our coach, we did not fail to notice the two-wheelers neatly parked along the narrow streets. The apartments there were small, clothes were hanging on the clothesline in the balconies and reminded us of India. Some spots looked like parts of Europe, others were typically Asian. We also saw the Penha Hill, the third highest hill of Macau. After that we went to 'Taste of India' for Indian buffet lunch. Everywhere eye-catching red lantern decorations and festoons swayed to usher in the Chinese New Year. 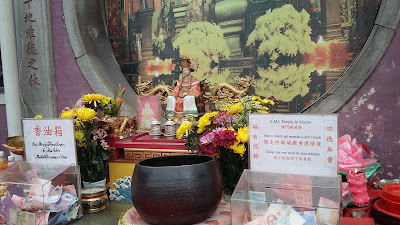 Our next halt was Maa Gok Miu better known as the A Ma Temple - a temple to the Chinese sea-goddess Mazu. 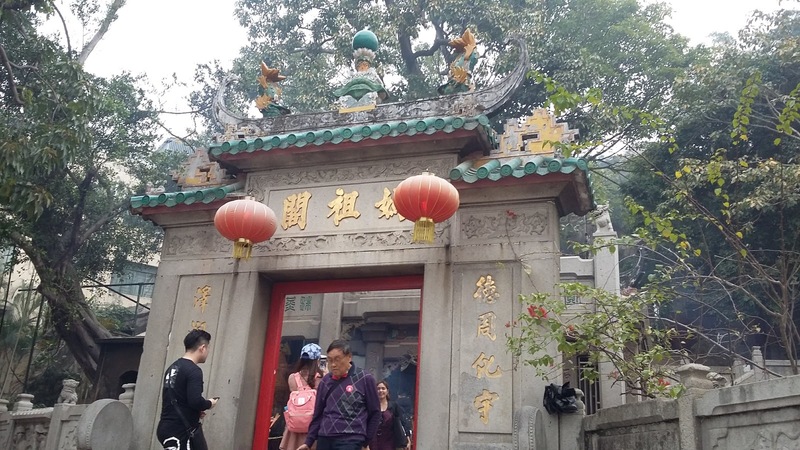 Built in 1488 during the Ming dynasty, the temple is one of the oldest in Macau. 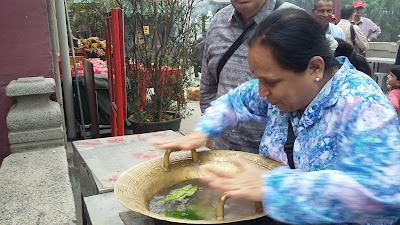 It is dedicated to Honored Mother A-Ma, a goddess revered throughout the South of China. The goddess chiefly looks after sailors and seafarers. Although she came from Fujian Province, the Macanese have adopted her as their own and, over time, a local version of her story was created. They say that the young girl was looking for free passage from Fujian to Guangdong, but all the wealthy junk boat captains refused. A poor young fisherman offered to take her but as they set off, a huge storm wrecked all of the boats at sea except theirs. Her magical blessing brought the two of them to Macau safely, where she vanished. Later, she appeared as a goddess and it is at the spot that the A-Ma Temple now stands. The name Macau is thought to be derived from the name of the temple. It is said that in the mid 16th century, when the Portuguese sailors landed at the coast just outside the temple and asked the name of the place, the natives replied Maa-gok ("The Pavilion of the Mother"). The Portuguese then named the peninsula "Macau". The upturned roof ridges are a distinctive feature of the temple. We had the chance to try out an interesting experiment there. There was a large shallow metal vessel of water. We had to rub the sides with our hands with a wish in our hearts. If the water started 'dancing' (spurting up), the wish would be granted. Most of our group tried their skill and were happy to be successful - most of them had wished for luck at the Casino in the Venetian later in the day! We then visited Macau Tower. We took the elevator to the 58th floor and enjoyed the bird's eye view of Macau. We could also see enthusiasts going for 'bungee jumping' from the 61st floor. We proceeded to the next level - 61st floor. Its open observation deck offers not only panoramic views and restaurants and shopping malls but also offers a variety of adventurous activities like 'Sky walk', a thrilling walking tour around the outer rim. More adventurous is 'sky jump' (the highest commercial 'sky jump' in the world - 233 m) and Bungee Jump from the Tower's outer rim. We saw the bungee jumpers in action from close quarters. I don't know what they felt but I could definitely feel my stomach churn. We came down and went out to the open space where we got to see the bungee jumpers come down all the way and land. Our Tour Manager had to herd us back into the coach warning us that we would lose precious minutes out of an hour at the Venetian if we didn't hurry. 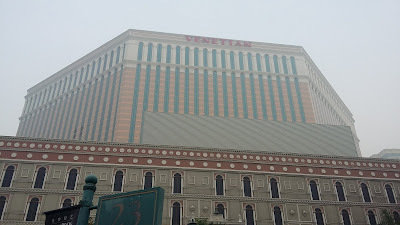 Both of us were excited to be visiting The Venetian Macao - not for the thrill of gambling but because we would be able to compare this Venetian with the Venetian Las Vegas where we had spent two wonderful days when our son had taken us on a trip to Vegas in 2013. 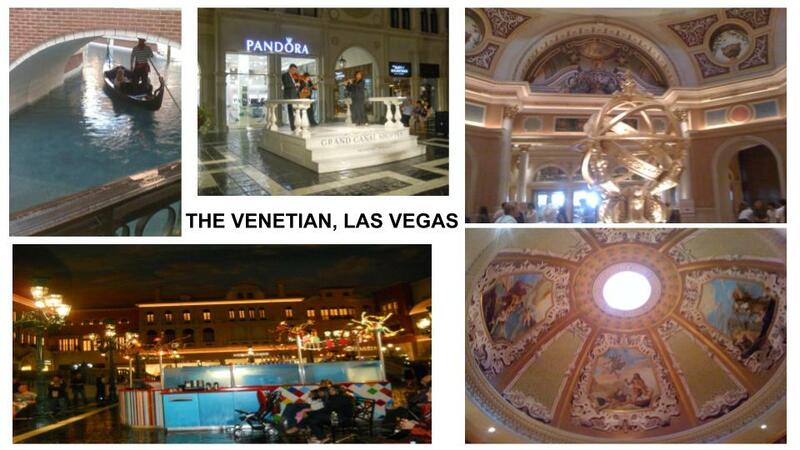 We had been overawed by the sprawling splendor and razzle dazzle of the place. 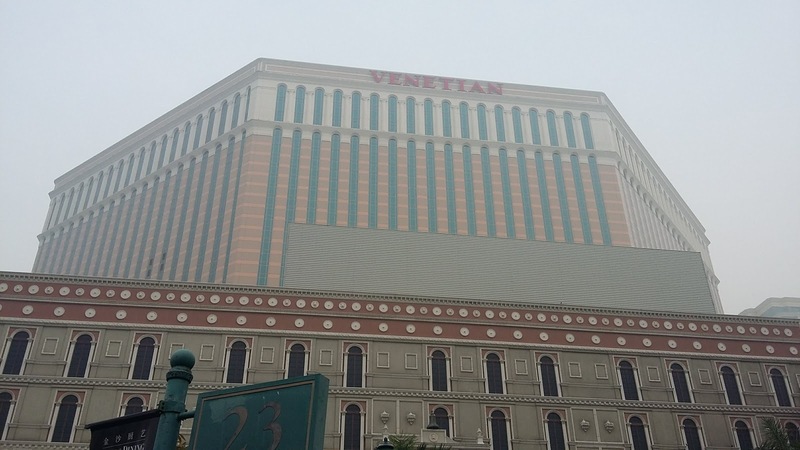 How would Venetian Macau turn out in comparison for us? Agreed it is not fair to compare but I couldn't help it. with 4,049 rooms, 3,068 suites. But its casino makes up only 120,000 sq. ft. of gaming space. with a whopping 550,000 square feet of casino space – with 3,400 slot machines and 800 gambling tables. The gambling area is so large it’s divided into four themed gaming areas: Imperial House, Golden Fish, Phoenix, and Red Dragon. Basically, it’s the Disneyland of the gambling world. The largest single structure hotel building in Asia, The Venetian Macao has 3,000 suites, a 15,000-seat Cotai Arena for entertainment and sports events. 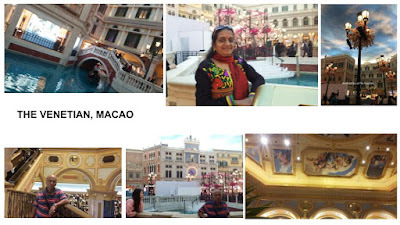 As we went around the Venetian Macao, we found it a replica of the Vegas Venetian, from the lobby to the Grand Canal Shoppes, including the gondola, St. Mark's Square, paintings on the roof, the artificial sky, Casino area ...... Did we gamble? Well, we had planned to utilize the gift of 20 HKD gifted to each of us by the company. But the slot machines were not friendly or cooperative. We didn't bother to find assistance or instructions to operate them as the Casino was jam packed. So we reconverted our bill again to 20 HKD. The non-gamblers like us spent some time watching the enthusiastic ones at the various tables and then moved around the magnificent place savoring its splendor for an hour. We boarded the coach at 5.30 pm and started driving to Cotai Terminal. On the way, we got to see only a few more Casino resorts, though we had been told there were some 40 Casinos around. A short drive, and we were at the Cotai Terminal to catch our ferry back to Hong Kong. We had been advised by our Tour Manager to walk confidently through Immigration without faltering or halting unnecessarily so that we wouldn't rouse suspicion or get randomly pulled over for questioning. As luck would have it, the youngest couple from our group were stopped for questioning but were lucky enough to be let off within minutes, so they could also join us in the ferry. We sat through the pleasant one hour cruise from Macau to Hong Kong, leisurely chewing the cud of the day's fantastic experiences in Macau.